The title of Evangelia Kolyra’s new work derives from an estimate for the amount of air that passes through our lungs each day in the process of respiration. After the Rich Mix performance of 10,000 litres I was walking to Old Street tube station when I saw a man in his crash helmet lying very still on his back beside his motorcycle and the van with which he had collided. In the theatre, respiration had been in play, while on the street respiration was held in the balance between life and death. The contrast was stark but rather than influencing my feeling about 10,000 litres, it served to underline the sense of lightness I had felt in Kolyra’s theatrical treatment of something that in a different context appeared so vital and precarious. It would be safe to say 10,000 litres is not primarily concerned with the physiological phenomenon of breathing but rather with its primary role in the process of movement; without breath, as with the image of the motorcyclist, there can be no movement. In effect it is the lungs of the three dancers (Joss Carter, Justyna Janiszewska, and Kolyra herself) that are given principal roles in 10,000 litres, costumed in hooded plastic breathing suits designed by Sisters From Another Mister, and amplified through the use of microphones embedded close to the chest. The set, designed by the same Sisters, is sparse with a white floor and two black metal chairs while Sherry Coenen’s lighting completes a predominantly clinical environment for these breathing machines. We first see two of them, Kolyra and Janiszewska, lying supine side by side as if laid out on two hospital beds. They begin a conversation, distorted by speaking through the inbreath as well as the outbreath, about the present and future as if the two are on the verge of dying and departing to the unknown. The words are full of ambiguity with a nod to the absurd, but there is an uncertainty as to where the scene has come from and where it is going. The program note suggests that ‘three individuals take movement right back to its most essential function and use it to define their personality and create relationships whilst touching upon issues of existence, power and freedom.’ This opening would fit into that premise if movement was used as its primary means of expression, but it is the words that take precedence. It comes across as a false start, for elsewhere in the work Kolyra develops physical images for the working of the breath that, without recourse to words, are more eloquent. When the trio of dancers plays a game of mutual gagging, repeatedly stopping each other’s breath with their hands to the point of exhaustion, the image has political and military overtones. Unfortunately the costumes seem out of place in this sinister usage, diverting any sense of threat to a clinical exercise. There is a similar mismatch of costume and tone later in the work when Carter places a harmonica in his mouth to extrapolate his volatile breathing as he tests his increasingly precarious balance on a tilting chair. However costume and movement do work together when the three dancers lie side by side and use their undulating chests, two harmonicas and Janiszewska’s voice to create an amoebic musical trio. 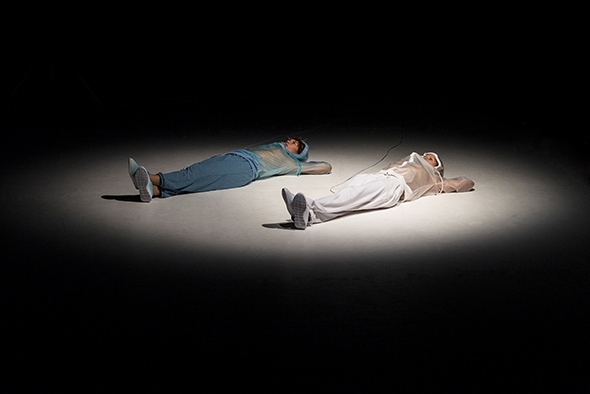 Kolyra’s horizontal flip over Carter’s supine form during a sequence of lateral shifts is the kind of physical humour that seems to derive naturally from her brand of theatre. Costumes aside, these physical explorations seem to respond more closely to the promise of 10,000 litres and I wish Kolyra had developed them further rather than resorting to the textual links which tend to dilute the significance of the work to a level of lightness and frivolity that the accident outside only exacerbated.